IN the year 1837, about, the time that Queen Victoria began her, reign the foundations of the present church of St. Stephen, Sneinton were laid. The church, which cost £4,700 to build, is erected from the designs of the celebrated architect Hickman, who was a member of the Society of Friends, but whose knowledge of ecclesiology was phenomenal. 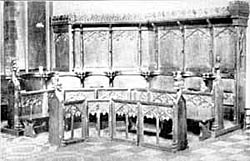 About the same time, considerable alterations were being carried out in St. Mary’s Church, and to make way for new pews, the ancient seats were ejected from the chancel, where they had been in constant use since mediaeval times. Fortunately, their interest and beauty was recognised by the enlightened authorities of St. Stephen’s Church, and some of them were placed in the chancel of the new church, where they still remain for the admiration of those who know of them. Their beauty is apparent from these photographs. The name " Sneinton " is of interest. It is a corruption of Snottington," that is the "ton " or dependent enclosure of the followers of Snot. Nottingham, or to give it its full title, Snottingaham," was the "ham" or principal settlement of the Snottinga, and their "ton," which was probably inhabited by their bondfolk, was of less importance and stood on a neighbouring hill. When the Normans came on the scene they found difficulty in pronouncing the initial letter " "S" so dropped it from the important town of Snottingaham, which thus became "Nottingham." Not being of much importance, Snottington did not attract much notice from the Normans, and so has retained its initial " "S," even to our own times. "Notintone Place " is the name of a well-known street in Sneinton, and forms a sort of half-way house between the ancient and modern name for this ancient settlement.